Temperament: The Rottweiler is courageous and confident dog. Contrary to popular belief the Rottweiler is a very calm natured and self-confident dog. They like to wait quietly and observe their surroundings. Rottweilers have an instinctive desire to protect their home and family. They are intelligent dogs who have a strong willingness to work. Family Dog: When properly and consistently trained, the Rottweiler will make a good playmate for children. They will generally accept cats and other pets provided they have a positive experience with them at a young age. Typically family and friends are welcomed enthusiastically but strangers are kept at bay. Shedding: The Rottweiler is an average shedder. Grooming: The Rottweiler's smooth, glossy coat requires little grooming. They should be brushed with a firm bristle brush and bathed only when necessary. Training: The Rottweiler requires firm training to keep from having a powerful and aggressive dog later in life. Due to their size Rottweilers should be trained at a very young age. Exercise: The Rottweiler needs lots of daily exercise. They should be taken on a long daily walk or run. 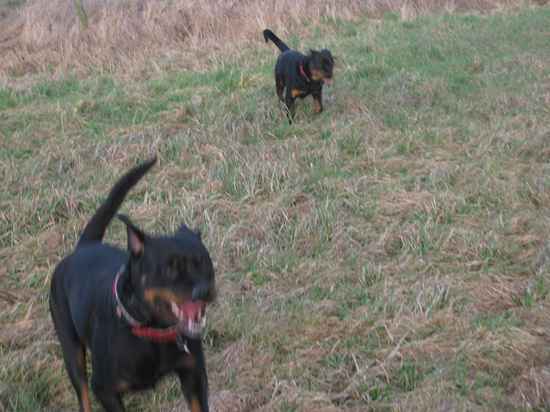 They love a long run through the woods, running beside a bicycle, retrieving a ball or swimming. Living Conditions: Rottweilers will do okay living in an apartment provided they get plenty of daily exercise. They are fairly inactive when inside and will be fine with a small yard. Appearance: Rottweilers are medium-large dogs with a robust and powerful build. They have a black coat with rust colored markings. Males are characteristically larger and have a heavier build than female Rottweilers. Size: Male Rottweilers range between 24 to 27 inches in height with a weight of 96 to 130 pounds. Females typically have a height ranging between 22 to 25 inches at the withers and an overall weight between 85 to 155 pounds. Companionship: With proper training the Rottweiler can be a loyal and loving companion. They require lots of companionship and socialization to be happy. Head: The Rottweiler's head should be broad and of medium length with a moderately arched forehead. The stop and zygomatic arch should be well developed. There may be some wrinkling on the forehead when dog is alert. The Rottweiler has an alert, noble and self-assured expression. Nose: The Rottweiler's nose should be black in color and broad instead of round and always black. Eyes: The eyes of the Rottweiler are dark brown, medium sized with an almond shape. They should be deep-set, neither receding nor protruding. The eyelids are well fitting. Ears: The Rottweiler has medium sized, triangular shaped, pendant ears. They are set well apart on the head and fall forward with the inner edge touching the side of the head. When the dog is alert the ears are carried level with the top of the head. Muzzle: The muzzle is straight, tapering towards tip. The Rottweiler has a broad and well developed chin. The ratio of the head to the muzzle should be 3:2. The lips of the Rottweiler should be black in color. Teeth/Bite: The Rottweiler has strong, broad jaws with 42 teeth meeting in a scissors bite. Neck: The Rottweiler has a powerful, muscular, slightly arched neck of moderate length. It should be free from any loose hanging skin. Body: The length of a Rottweiler's body should be slightly longer than its height at the withers. The most desirable body proportion is a 9:10 ratio of height to length. The depth of the Rottweiler's chest should be approximately half of the dog's overall height. The forechest is pronounced, ribs well sprung and oval. The muscle and bone should be balanced with the size of the body, giving the Rottweiler its compact yet very powerful appearance. The topline should be firm and level both while the dog is standing still or in motion. Mature Rottweilers have a slight tuck-up in their underline. The Rottweiler's loin is muscular, short and deep. The croup should be medium length, broad and slightly sloping. Forequarters: The Rottweiler should have long and well laid back shoulder blades equal in length to the upper arm. The elbows should be set well under body at approximately half the distance to the ground. The front legs are straight, well developed and heavily boned. They should not be set too close together. The pasterns should be springy and strong set perpendicular to the ground. Hindquarters: The upper and lower thighs of a Rottweiler are long, very broad and muscular. The stifle joint is well turned out. There is extensive muscling running from the lower thigh into the strong hock joint. The Rottweiler's rear pasterns should be nearly perpendicular to the ground. The hind legs are straight, strong and set wide enough apart to accommodate a properly built body. Gait: The Rottweiler has a balanced and powerful trot with strong front reach and powerful drive. The Rottweiler appears efficient and effortless when in motion with each stride covering maximum ground. The legs are straight in line with each other with the imprint of rear feet touching that of front. The Rottweiler's back remains firm and level through each stride. The feet will converge towards the center line as the Rottweiler's speed increases. Feet: The Rottweiler has round, compact front feet and slightly longer rear feet with well arched toes, thick pads and strong, black nails. All the feet should face forward and turn neither in nor out. The front dewclaws may be removed while the rear ones must be removed. Tail: The Rottweiler's tails is always docked close to body. There should be only one or two tail vertebrae remaining. The tail should be set as to give an appearance of elongating the topline. It should be carried slightly above the back level when the dog is moving or excited. Color: The Rottweiler's coat should be black with rust or mahogany markings over each eye, on the cheeks and throat, a strip on each side of the muzzle, a triangular mark on each side of the prosternum, on the forelegs, on the inside of rear legs and under the tail. The undercoat should be tan, black or gray in color. The quantity and location of the Rottweiler's markings are very important and should never exceed 10% percent of the body color. Coat: The Rottweiler has a doublecoat consisting of a straight, coarse, thick outercoat and undercoat on the neck and thighs. The coat is of medium length and lies flat against the body. The thickness of the undercoat depends on the current climate conditions but should never show through outer coat. The coat on the head, ears and legs should be short. Life Expectancy: The average life expectancy of a Rottweiler is 10 to 12 years. Characteristics: Rottweilers are well suited as a both companion and guard dog. This breed requires an owner capable of handling their massive size. The Rottweiler is very intelligent and highly valued for their work as police, military and customs dogs for many centuries. Despite their great working abilities they can be aggressive with other dogs and should always be leashed in public areas. Rottweilers make great watch, guard and police dogs. They also do well in tracking, herding, carting, schutzhund and obedience competitions. Litter Size: Rottweilers often have large litters of up to 12 pups. History: It is believed that the Rottweiler is a descendent of the Italian Mastiff, later bred by the Germans in the town of Rottweil in Wurttemberg. During the Middle Ages, the Rottweiler was used as a herding dog. They became practically extinct during the 1800s. Thanks to the effort of enthusiastic breeders in Stuttgart during the 20th century the breed's population began a comeback.